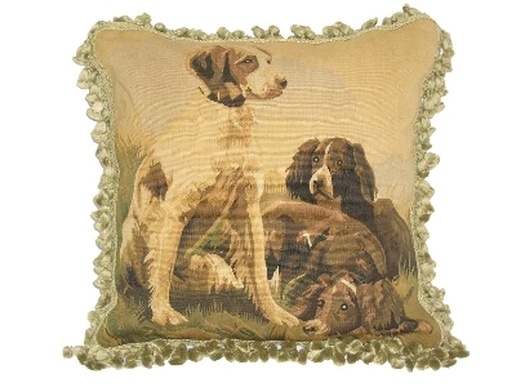 Some of you might remember this little doggie needlepoint pillow from my post about estate sales HERE. The needlepoint piece had actually been in a frame when I bought it, so I took it out of the frame and made it into a cute little pillow to sit on my cute little child's chair. I've always loved needlepoint and began working on canvases while I was still in high school. I guess that I inherited my grandmother's sewing gene, because I enjoy sewing and learned on her treadle sewing machine. She made my dolls' clothes, smocked dresses and all sorts of other nifty things. My daughter also inherited the sewing gene, but she makes much more interesting things than I do. She once made a prom dress out of bubble wrap. She's made mermaid suits, a canopy of tulle, and a covered pavilion out of an old sail cloth. She's one of those natural seamstresses; she doesn't use patterns. Anyway…… to return to my story. Unfortunately, needlepoint seems to have fallen out-of-favor in the last few years. During Queen Victoria's time, every proper young lady learned many forms of needlework, including needlepoint. (Had to get those trousseaus ready for when they got married.) But needlepoint is time-consuming and can create a "fussy" look to some people, who believe that it only belongs in grandmother's homes. I completely disagree! I'm not a grandmother and I certainly think that needlepoint is classic and will always have a place in my house. Every Christmas I get out the stockings that took me forever to needlepoint for my children, and I think that they look beautiful on my mantelpiece. So what if you can buy a needlepoint stocking made in China for less than $20 now? It's just not the same, I tell ya! I've found a few other needlepoint dog pieces at estate sales. The following is a Schnauzer that was also framed when I bought it. I'm planning to either reframe it or turn it into a pillow. It's not as orange as it looks in this picture. It's more of a red-red than an orange-red. My friend Julie (what would I do without her?) bought the following needlepoint dog for me, also at an estate sale. You can tell that it's old because of the discoloration of the canvas. When she bought it, it had already been made into a pillow. But the trim didn't match my color scheme, so I'm going to re-do it. By the way, does it remind you of anyone? Can you believe it? It's Bitsy! Btw, Bitsy is due for her summer haircut. Next time you see her, she'll look like a little lamb (literally). Speaking of needlepoint made in China, I bought the following Pug pillow at Steinmart years ago. I love the yellow, although I don't have much of it in my house. It's actually very well-made. It's done in petit point, which means more stitches per square inch. Very time-consuming. I completed the following Elizabeth Bradley kit of a Cavalier King Charles Spaniel recently. The kit included the canvas with the needlepoint design painted on it as well as all of the yarn needed to complete the piece. After I finished the needlepoint, I made it into a pillow to go in my living room/library. I doubled the pom-pom trim to make it fuller. Love those colors! 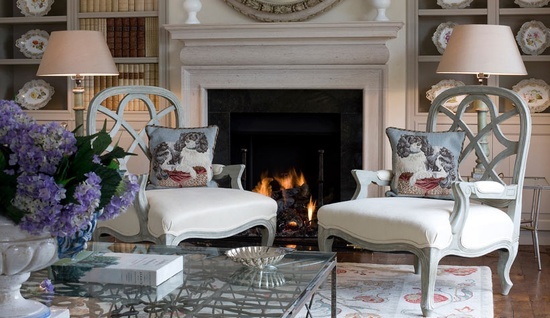 A photo on the Elizabeth Bradley website HERE shows the same pillow done in a different colorway. 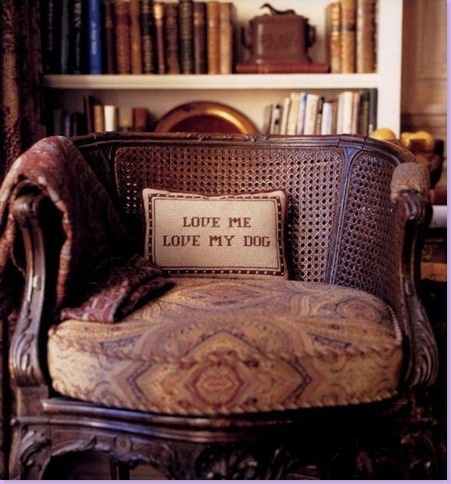 Most of you have probably heard of the interior designer Charles Faudree and know that he loves dogs!!! The following photos show some of his interiors with a canine influence. This is the top of a footstool in one of Charles Faudree's interiors (with lots of trim, of course). 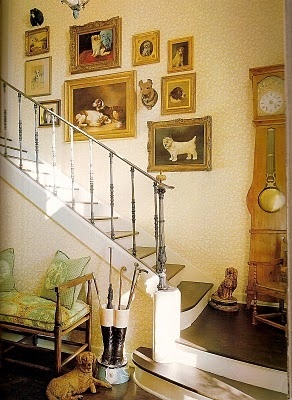 What a wonderful doggy vignette Faudree has created on this stairwell. While the above images of dogs aren't all needlepoint, I wanted to include this photo in my post because I love the way that they've been grouped. My husband and I need to move to a two-story house so that I can do this on the stairway. 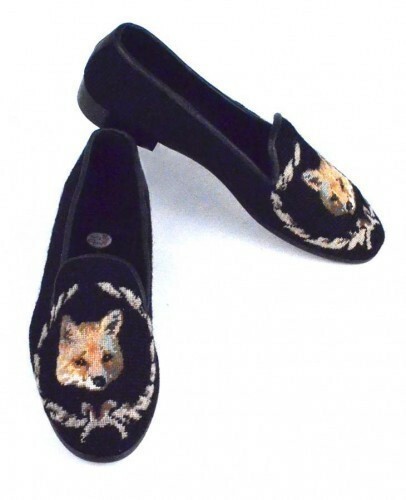 While I was rummaging around on Pinterest looking for needlepoint dogs, I came across these needlepoint fox slippers. Aren't they fab? I just couldn't resist showing them to you. The following photo shows my latest acquisition from one of my favorite antique stores in Dallas. I love it! This is definitely an old needlepoint, but I'm not sure about the frame. Someone told me that it's in the "Black Forest" tradition. Anyone out there in Blogland know anything about this frame? It's made of dark wood and is hand-carved. It has an inset piece of wood that's painted gold and all banged up with cracks and chips (my favorite kind). I just love this sweet boy. The lady from whom I bought him told me that she found it in England. Such a serious expression. Would love to know its history. This beautiful pillow is from The Enchanted Home Shop HERE. It's not needlepoint but Aubusson, which is a woven tapestry. Isn't it beautiful?. So that's the story on my dog needlepoint collection, with a few other items thrown in here and there. Hope y'all enjoyed it and thanks again for stopping by. Yes, that bamboo corner chair is Victorian. It looks nice but I don't think I would want anyone to sit in it. It's a bit rickety and not very comfortable. Thanks for dropping by. What a fantastic post! My goodness - so much information! I am especially impressed with your Christmas stockings. I attempted a needlepoint rabbit that was supposed to be assembled into an actual stuffed animal when completed... that never happened. I tired of that project very quickly! Loved all the info, the dog theme of course, and Tina will love that you included the adorable pillow from her store! LOVE the needlepoint pups, Kathy! Your stockings are so pretty and such a labor of love. I made afghans for my children when I was pregnant with each and quilts too. I wish I still had the time to do those things! Such nice heirlooms to pass on down. Have a great weekend, Kathy. Thanks for sharing this post. I soooooooo enjoyed it! Hi, I'm a new browser but love the pup pillows. The 2nd to last pillow caught my eye as we have two English springer spaniels, the pillow is a ringer for our 6 yr old Molly. She has this exact suffering look as we've just added a 3 month old puppy to the mix. Springers are great dogs but they sure can turn on the sad eyes when needed. I used to needlepoint and made two detailed Christmas Stockings painted by two talented artists for my husband and myself. It has been over 20 years and I still love taking them out each year. Just recently, I decided to cut down on my knitting and go back to needlepoint. Now, it may just be my "old-lady/Grandma taste", but I feel needlpoint pillows add warmth to a room. I miss handmade items in decor. Why has this gone out of style for so many people? Anyway, I hope needlepoint sees a return in popularity. I am becoming tired of looking at shelter magazines with photos of the same style of decor.